LOS ANGELES -- Velvet Revolver guitarist Slash and his wife lost more than $500,000 in the purchase and subsequent sale of a Hollywood Hills home they allege they were duped into buying, the woman states in a sworn court declaration. Perla Hudson's statements were filed in connection with a lawsuit she and her husband filed in November 2007 in Los Angeles County Superior Court and amended in mid-March 2008. Real estate agent Gregory Holcomb and Sotheby's International Realty, named as defendants, maintain there was no way of knowing that the Multiple Listing Service description of the home was incorrect and that it was not actually on a private street. 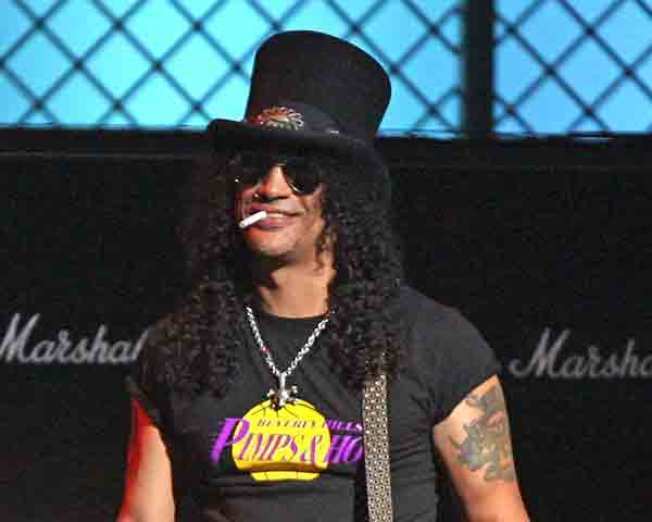 The 43-year-old Slash, whose real name is Saul Hudson, became famous as the lead guitarist for Guns N' Roses. His wife's declaration is in support of the couple's opposition to a defense motion to dismiss portions of their suit dealing with alleged causes of action for fraud and breach of fiduciary duty. A hearing on the motion is scheduled Jan. 23. In her declaration, filed with the court on Friday, Perla Hudson says she and her husband closed escrow on the home in January 2006 for $6.25 million, then sold it in November 2007 for $5.725 million without ever moving in.